Resistance bands resemble long and stretchy jump ropes. They are usually made of rubber or a similar material that provides enough strength while still stretching with the user’s movements. They come in different colors and different band resistance. The two common resistance bands are the basic resistance bands and resistance tubing equipment and they are color-coded according to resistance level and intended use. Basic resistance bands are wide rubber strips. They are of differing lengths depending on the intended use and desired resistance level. Tube resistance equipment may be made of rubber or cord. Like basic bands, tube resistance bands vary in length. They may come with door attachments or cuffs for different workouts, and they usually have foam or plastic handles. Foam handles are usually preferable since they can help prevent soreness or blisters after a long workout. They are many resistance band brands in the market and I have tried quite a number of them but my most favorite brand is Sanctband. They specialize in low protein and powder-free latex resistance bands which are great for medical rehabilitation, geriatric, and fitness specific needs. They are widely used by Physiotherapists, Personal Trainers, Yoga, Pilates Instructors as well as Fitness, Strength and Conditioning Coaches. 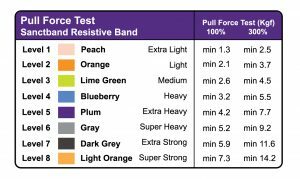 The Sanctband Resistance Bands comes in 8 different colors in 8 resistance levels as shown in the picture below. As a Fitness Professional, I incorporate resistance bands into my training program for clients as well as my own training. If you have not read my other article titled “Resistance Bands Vs. Free Weights”, please do as it states my opinions on the benefits of using resistance bands and why resistance bands are more powerful, more effective and safer than using free weights. Sanctband Resistance bands carries many useful features and the best feature I like is NON-STICKY. Unlike other bands, they stick together after washing and you have to apply powder on them for separation. On a final note, start incorporating resistance bands or resistance tubing equipment into your training program for either fat loss or muscle building or even strength building, you will not regret it! Be sure to pick one that is appropriate for your current strength level. For Beginners (those who have never used free weights ever), please start with Peach. For Intermediate users (depending on your fitness goal be it to increase more strength and power or better fat loss), please pick Blueberry or Plum. For Advance users, you could start from Level 5 and then progress each level. Similarly, to other users mentioned above, always start with a color-coded band that you are comfortable with and then progress from there. Baby progression is key. Never rush into a level without feeling comfortable with the band exercises. You will know when to progress to the next color or level. Your muscular strength will be the one to RED FLAG. For me, I will know when I can and can’t comfortably perform 3 regular sets of each color-coded band. By the end of set 3 (10 to 15 repetitions), I can still perform comfortably, I should progress to the next level. If I can’t which means I end at a failure repetition, I will continue to work on the same color-coded band until my body tells me to move on. Try it. You never know unless you give it a shot. Have fun!